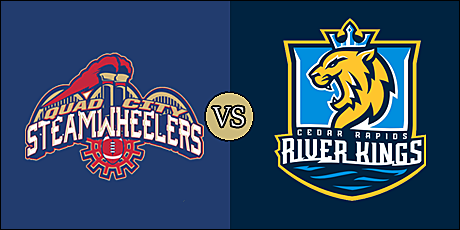 CEDAR RAPIDS, IA - Wide receiver Quinton Pedroza scored six offensive touchdowns to lead the Quad City Steamwheelers over the Cedar Rapids River Kings, 58-36, tonight at U.S. Cellular Center. The Steamwheelers improved to 2-1 on the young Indoor Football League season, while the River Kings fell to 1-3. It was Quad City's first road win of the season. The 36 points were the least scored by Cedar Rapids on the season. The River Kings struck first on the opening possession, capping a five-play, 17-yard drive with a 23-yard field goal from Henry Nell. Quinton Pedroza's four yard sweep around the left side put the Steamwheelers on the board after an eight-play, 45-yard drive. Kurt Palandech threaded the needle to Marquel Wade, who raced to the end zone for a 43-yard touchdown to put the River Kings up 10-7 with five minutes to go in the opening quarter. Kenneth Rowe's 29-yard field goal pulled Quad City even by the end of the quarter. Nell added a 22-yard field goal to put the River Kings back in the lead early in the second quarter. The Steamwheelers struck twice on a pair of touchdown passes from E.J. Hilliard to Pedroza of 13 and 12 yards to lift them to a 24-13 lead with 3:22 remaining in the half. Wade rushed around the right side from three yards out, but Henry Nell's drop kick try wobbled wide to the left. Hilliard found Keyvan Rudd for a 15-yard touchdown strike with 28 second left in the half. The Steamwheelers led 31-19 at the break. Quad City added to their lead on the first drive of the second half when a leaping Pedroza caught an 11-yard touchdown from Hilliard as he was headed over the dasher board in the end zone. Rowe's extra point was blocked Cedar Rapids' Damante Horton and scooped up by Kelvin Jenkins who returned it 48 yards to give the River Kings two points. After holding Cedar Rapids to a turnover on downs, the Steamwheelers marched down, scoring on a nine-yard touchdown run around the left side by Pedroza, and Quad City led 44-21 at the 6:44 mark of the third quarter. Palandech hit Wade on a 19-yard scoring pass. That, along with Kalif Mitchell's two-point conversion run around the right side pulled the River Kings to within 15 points at 44-29. The Steamwheelers came right back with Hilliard to Pedroza on a 35-yard bomb with nine seconds left in the quarter. Quad City led 51-29 after three. The Steamwheelers added to their lead on Hilliard's three-yard lob to the left to Rudd which doubled the score, 58-29 with just over six minutes to play. Cedar Rapids scored on a 12-yard touchdown from backup QB Ben Wilkerson to Demetrius Harper with 1:19 left and the River Kings deficit was 58-36. That would turn out to be the final. Quad City held the advantage in total offense, 287 yard to 168. That included a 140-yard to 66 edge in the rushing game. Each team was penalized six times in the game. Each team also recorded a single sack, though there were no turnovers committed in the game. Pedroza had game highs of six receptions for 105 yards and four touchdowns, and he ran three times for 21 yards and two scores. Hilliard was excellent, completing 12 of 19 passes for 147 yards and six touchdowns. Newly signed Juwan Lewis left the game in the first half after rushing five times for 42 yards. He was replaced in the second half by backup quarterback Dillon Turner, who gained 38 yards on eight rushes. Keyvan Rudd hauled in three passes for 22 yards and a pair of touchdowns. Danzel McDaniel's seven total tackles led the Steamwheelers' defense, and Robert Jones had a sack. Palandeck finished eight of 15 for 104 yards and two touchdown passes. In addition to his two-point conversion run, Phillips gained 24 yards on 10 carries. Wade caught 5 passes for 83 yards and two touchdowns, and ran for another score. Harper added three catches for 27 yards to his touchdown grab. Ricky Johnson recorded six total tackles for the Cedar Rapids defense, while Malik Slater and Eric Banford shared a sack. The Steamwheelers will visit the Sioux Falls Storm on March 22 with kickoff set for 5:05 p.m. pacific (7:05 p.m. central). The River Kings have a bye in week 5 before returning back to action on March 30 when they host the defending champion Iowa Barnstormers. Kickoff for that one is scheduled for 5:05 p.m. pacific (7:05 p.m. central).